Internalizing symptoms such as withdrawn and anxious-depressed behavior are common in adolescence. This prospective longitudinal study helps to gain insight into the development of internalizing behavior, focusing on the role of early parent–child interaction while ruling out genetic similarity as a confounder. More specifically, the central question addressed in this study was whether parental sensitivity and child inhibited temperament predict children’s withdrawn and anxious-depressed behavior in middle childhood and adolescence. We followed 160 early-adopted children (53 % girls) from infancy to adolescence. Structural equation modeling was used to test relationships both prospectively and concurrently. 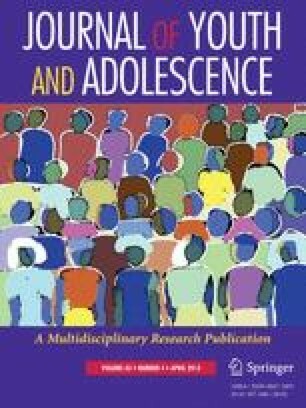 The results revealed that more sensitive parenting in infancy and middle childhood predicted less inhibited behavior in adolescence, which in turn predicted fewer internalizing problems in adolescence. The findings suggest that maternal sensitivity lowers adolescents’ inhibited behavior and decreases the risk for adolescents’ internalizing problem behavior indirectly through lower levels of inhibition. Supporting sensitive parenting in the years before adolescence may protect children from developing inhibited behavior and internalizing behavior problems in adolescence. Support from the Netherlands Organization for Scientific Research to the fourth author (NWO VIDI and VICI grant) and to the sixth author (NWO SPINOZA Prize) is gratefully acknowledged. Femmie Juffer is supported by Wereldkinderen. All authors have contributed to the manuscript in a meaningful way. F.J., M.J.B.K., and M.H.v.I.J. conceived of the study and its design and performed the measurements; M.L., F.J., M.J.B.K., and M.H.v.I.J. participated in the coordination of the study; A.v.d.V., M.L., M.H.v.I.J., M.J.B.K., and F.J. participated in the statistical analysis and the interpretation of the data; A.v.d.V., M.L., F.J., M.J.B.K., and M.H.v.I.J. drafted the manuscript; C.S. supported the interpretation of the data and the drafting of the manuscript. All authors read and approved the final manuscript. Kok, R., Linting, M., Bakermans-Kranenburg, M. J., Van IJzendoorn, M. H., Jaddoe, V.W.V., Hofman, A., et al. (2013). Maternal sensitivity and internalizing problems: Evidence from two longitudinal studies in early childhood. Child Psychiatry & Human Development. doi: 10.1007/s10578-013-0369-7.